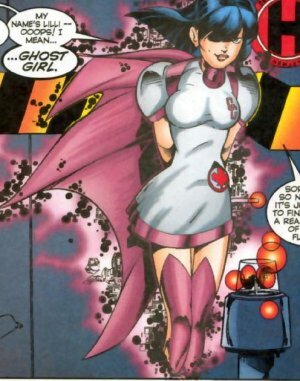 Powers/Abilities: Ghost Girl has the mutant ability to alter her body's density, giving her the ability to phase through walls. She could also use her body as a portal for others to pass through barriers like doors and walls. It is unknown what other abilities or powers she may possess. (Alpha Flight II#4 - BTS) - Lilli spent her early childhood living with her grandfather on his cattle ranch. After his death, she was sent to live at the Hull House orphanage in Orloo in Ontario, Canada. While in the orphanage, Lilli’s mutant powers began to manifest which was noticed by the headmistress, Mrs. De La Salle, who then contacted Department H to tell them that she was one of the "legacy" children. (Alpha Flight II#2) - Lilli was sitting up against a tree as a Frisbee was thrown in her direction and passed harmlessly through her body. Coordinator Proctor, at Beatrice De La Salle’s request, was present and witnessed the event and then arranged her relocation to Department H.
(Alpha Flight II#3) - The city of Orloo began to experience a series of minor earthquakes and unexplained high winds. Lilli and the rest of the city were told to stay indoors for their own safety. (Alpha Flight II#4) - Lilli, believing herself to be newly adopted, was given a celebration and going away party at the orphanage and bid her best friend Claire a heartfelt goodbye, promising to write to her and even asking her new parents to adopt her as well. Soon after leaving the orphanage, Lilli discovered that she was never adopted but had instead been recruited by Coordinator Proctor to become a superhuman operative in Canada’s Department H. While at Department H, she was shown hypnotic films, measured for a costume, fed energy building drinks and given an identification tattoo on her lower back. (Alpha Flight II#5) - Lilli, upset and scared, escaped her confinement and isolation within the Beta Flight wing at Department H and approached Diamond Lil in the reception area before imploring her for help because she no longer wished to be there. Two red Epsilons quickly escorted her back to her room and Diamond Lil remarked that the girl looked somewhat familiar. (Alpha Flight II#8) - While sneaking out of her room, Lilli ran into Alpha Flight’s Puck and conversed with him about not being able to contact her friend Claire by telephone. She also told him that Coordinator Proctor was supposed to join Alpha Flight but all she ever did was train and do weird tests. Puck directed her to a nearby room with a phone and promised to get her some answers. (Alpha Flight II#9) - After a series of grueling tests, Lilli began to freak out and demanded to leave Department H. General Clarke quickly arrived and calmly settled her down with lies, promising to provide her with her wishes. After being calmed, she was given a sedative and then sent to have a procedure done to wipe her memories of the past incident. (Alpha Flight II#12 - BTS) - Lilli and the other Alpha Flight trainees, Ouija and Flinch, were locked in their residential wing while the Zodiac attacked Department H.
(Alpha Flight II#14) - Lilli met General Clarke’s replacement, Mr. Gentry, and was informed that from now on she would be living in the Alpha residential wing. Excited, she ran out of her room to tell Ouija the news. (Alpha Flight II#16) - Now dressed in her new costume, Lilli started moving her belongings into the Alpha residential wing and was introduced to Murmur. (Alpha Flight II#17) - While carrying a box of her personal effects and walking down a hallway toward the Alpha Wing, Lilli bumped into Flex who was in a hurry. Flex apologized and helped her to her feet. Their eyes met and they felt a strong personal attraction toward each other. (Alpha Flight II#18) - Lilli was present in the Alpha Flight training room alongside Murmur and Flex while Radius took part in a dangerous training session. (Alpha Flight II#19) - Using her codename, Ghost Girl, Lilli joined the rest of Alpha Flight on her first mission with the team to stop the new Weapon X from rupturing his containment suit using Department H’s top secret atomic incinerator dubbed the Hellpounder and contaminating the city of Vancouver with deadly germs. While on the Alphajet, she and Flex began flirting with each other. (Alpha Flight II#20) - Alongside her team, she battled the original Alpha Flight. Outside the Hellpounder, she instructed Puck and Flex to walk through her phased body to use as a portal so that they could gain quick entry in order to deactivate the destructive machine. Now outside the Hellpounder, she was ordered to protect Mr. Gentry while the rest of Alpha Flight attempted to shut the Hellpounder down and stop the new Weapon X from succeeding in rupturing his suit. Joining with the both the new and old Alpha Flight, the machine was stopped and they all returned to Department H. She later joined the celebration of the formation of a new team consisting of both new and old Alpha Flight members. (Wolverine II#142 - BTS) - Not being considered up to the task of becoming part of Alpha Flight, the team was split in two and she, the younger Guardian, Radius, Flex, Murmur and Manbot became the new Beta Flight. Comments: Created by Steve Seagle (writer), Scott Clark (pencils) and Chris Carlson (inks). Lili's last name was revealed in the Official Handbook of the Marvel Universe A to Z hardcover#1: Alpha Flight entry.